Rental rooms are becoming quite the trend, but they’ve also turned into a need in the real estate industry. Not only are people with extra space looking to make a few extras dollars (raise your hand if that’s you! ), but many are not yet ready to buy their own home. Whether they don’t yet have the money, they’re trying to save, or they’re living somewhere temporarily and not ready to settle, rental rooms can be a solution. Take a fellow military couple I know as an example. As a graduate student married to an active duty service member, they couldn’t afford a house of their own. Plus, they knew that they would be at their duty station for a mere six months. And while they could’ve searched for a rental apartment, they seized the opportunity for the simplicity of a rental room and chose to save money during that season of their lives—and they don’t regret it. But they aren’t alone. There are many people out there (not just military) looking for the ease of a rental room. But you already know that, and you’re on the other side of the equation this time. And all you need now is to know how to make it happen and bring in that additional income! Choosing to rent out a room in your home isn’t an easy decision. Sure, when you think about it financially, it seems like a no-brainer, but there are a few more things to consider beyond Would you like to make a few extra dollars? Do you like living with other people? When there’s someone else living in your space, everything changes. Depending on the space you have available, you could share a bathroom, kitchen, living room, and more. Even if you have an entirely different rental area with a separate entrance for tenants, you’ll still notice less privacy. Do you have the extra space? Do you have the room to accommodate someone else? If you don’t have an extra room free of your personal belongings, it doesn’t matter if you have the best personality for the job or need the extra cash, renting space just isn’t an option. Is it legal where you live? We’ll dive into landlord responsibilities a little further into the discussion, but laws vary and before you get someone moved into your home, you need to make sure that you’re not breaking any laws. Checking with your zoning laws, occupancy laws, and your Homeowners Association (if you have one) is a good place to start. Believe it or not, there are laws in place to prevent too many people living in one place. But two people to a bedroom is a good rule of thumb. Make space. Are there empty rooms or rooms that serve no functional purpose in your home? Chances are, that space would benefit you more from renting than sitting empty. The more space you have to offer for rent, especially a room with a private bath, the more money you can potentially make. Renter-proof it. If you’ve had kids before, then you know what it means to baby-proof the house. Though there’s no need to walk through the home and secure outlets, lock cabinets, and set up a baby gate, you do need to walk through with a critical eye. Remove self-locking doorknobs (to prevent lockouts). Determine a fair rental rate. Look at comparable listings in the area combined with the amenities you plan to offer. If you’re intending to rent to military, it’s a good idea to know the local BAH. Your listing will likely appeal to single service members who either don’t have a ton of money or who are trying to save. Who wants to argue about which person is using too much electricity or when the bills have to be paid? If the heating bill goes too high, just raise the rent and forget about it. He also shared that instead of charging monthly rent, he adapted to his tenants’ paydays. For example, he would charge weekly rent for tenants paid weekly, bi-monthly for bi-monthly paydays, and monthly for monthly. Why? Because he found that a portion of his tenants are like many of us and would often enjoy spending money on pay day. This ensured that rent was charged when they were sure to be able to pay and not after they’d spent it elsewhere. He never had any issues. Advertise. If you’re looking to attract military renters, a great place to advertise your space is on MilitaryByOwner. We do our best to ensure that your listing reaches the greatest number of military members and families moving to your duty station. You can also check out Roommates.com. Screen applicants. As with any potential tenant, you’ll need to have a completed rental application, verify income, run a background check, and call references. But, since you’re renting out a room in your home and this isn’t an average rental property, you’ll also want to chat with them. Need help getting started? Check out our partner US Legal Forms where you can find applications and more. Make sure that you get along. You certainly don’t have to be besties, but finding common ground and establishing mutual respect can help you choose one potential tenant over another. And above all, understand the Fair Housing Act (FHA). The Fair Housing Act is federally mandated to protect buyers and renters from discriminatory practices during real estate transactions, including securing financing. It’s there to ensure that a landlord can’t overlook an applicant based on race, military, familial status, and more. Take a look at Dawn Smith's article, Understand the Fair Housing Act When Listing Your Property, to gain a more comprehensive understanding of how the FHA relates to you. Create a contract. Bottom line--get everything in writing. As with any rental, you risk the integrity of your property when renting out to tenants. While it’s unlikely for major issues to arise since you’re present, you do assume risk. None of us want to think about anything going wrong, but getting the details like lease terms, rules, due dates, and penalties in writing will help protect you. What happens if the tenant doesn’t pay? Let’s say that the tenant loses their job, but doesn’t want to move out. The best thing you can do to avoid an escalating problem is to include penalties in the contract. It’s okay to let them know that if they fail to pay rent, they will be evicted and potentially sued for back rent. Communicating boundaries in early interactions is one of the best things you can do to avoid frustrations in your landlord/tenant relationship. Aside from establishing ground rules for space, you need to address a handful of other items as well. Pets. Do you have pets? Do they? Maybe a fish is okay, but are you okay with dogs? Pets often mean more noise and more mess. So, if you’re okay with an extra fluff ball running around, you should probably be clear about rules pertaining to them. For example, if you expect them to pick up the yard immediately, don’t allow digging, and want them crated while the tenant is away, you should put that into the written contract. Visitors. How social are they? Find out if they often host friends or frequently bring home dates. Are you comfortable with guests and overnight visitors? This is a good opportunity to talk about quiet hours and visiting times and make sure that you’re on the same page. Common areas. What space is actually available for rent? Ask yourself if you expect tenants to use the hallway bath, share the kitchen, and watch TV in the living room. What about groceries? How will you divide the kitchen? Are they free to cook anytime? Do you want to create an alternating schedule? You may be comfortable with an open setup with flexibility or you might find that you need a regimented schedule to create strong boundaries and maintain some privacy. Whichever you’re most comfortable with needs to be communicated to potential tenants immediately, because not only are you trying to find a good fit, but they are, too. Emotional. Aside from setting boundaries for the tenants, you need to set some for yourself. It’s much easier with a traditional rental property to leave well enough alone. But, since your tenants will be living in your home with you, it can be much harder to give them their space. Their door being right next to yours doesn’t give you permission to enter any time. Again, state laws vary, but most require that you give the tenant 24 hours notice prior to entering the rental space. So, while this may seem like a less formal agreement--and it will when you see them grabbing a snack at 2 a.m. in their bathrobe--it’s not. And it’s your job to keep it professional. As with all rental properties, it’s your duty to make sure your rental property is habitable. The laws may flex by state, but there are a few things you should follow regardless of location. Structural safety. Since it’s your home too, it shouldn’t be too difficult to make sure that common areas, hallways, and staircases are safe and clean. Fire Safety. Building codes determine the proper window dimensions safe for a bedroom. Assuming your home is up to code, this shouldn’t be something that you need to give much thought. However, you should verify the space is compliant prior to renting out the room. Security. While you’d think that a double deadbolt lock would suffice, some cities require specific locks to be installed for rental room properties. It’s best that you consult your local laws to ensure that you’re compliant. Plumbing. It’s your duty to make sure that the tenant has access to running water—both hot and cold. All income is taxable, and the money you make from a rental room is no exception. However, there are a few things to keep in mind that will help you maximize your deductions and cut you a break come tax season. If you rent out a room in your home, the tax rules apply to you in the same way as they do for landlords who rent out entire properties. This means you get to deduct the expenses arising from your rental activity. There is one big difference however: You must divide certain expenses between the part of the property you rent out and the part you live in, just as though you actually had two separate pieces of property. Starting in 2018 (and scheduled to last through 2025) pass-through business owners—that is, owners of any business other than a regular C corporation—may deduct up to 20% of their net business income from their income taxes (less if taxable income exceeds certain levels). Renting a room to short-term guests can qualify as a business, especially if you earn a profit each year. Thus, if you own and operate your room rental activity as an individual (or tenant in common) or through an LLC or partnership, you may qualify for this valuable deduction. Just be sure to keep records of any purchases you make and consult a tax professional if you have any questions or doubts. 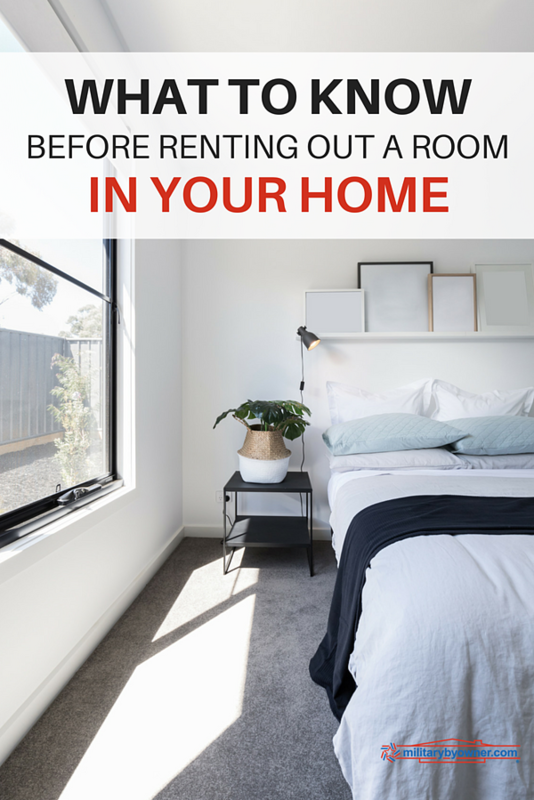 Renting out a room in your home is a fantastic opportunity to not only make a little extra money, but also help fill a need for people in your community. Just be sure that before you jump into anything you understand exactly what you’re getting into. Evaluate your own personality, space, and goals prior to making this exciting step a reality. And when you’re ready, hop on MilitaryByOwner and get your room out in front of potential tenants. As always, give us a call or jump onto chat if you have any questions or concerns. We’re here to help! Do you have a rental room in your home? We’d love to hear your experience. Leave a helpful tip or advice in the comment section below for future rental room landlords!